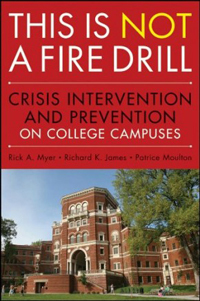 Written by three crisis intervention/prevention specialists with over fifty years combined experience in the field, This is Not a Fire Drill: Crisis Intervention and Prevention on College Campuses is a practical guide to creating a comprehensive college campus crisis management program. The authors provide university administrators, faculty, and staff with hands-on examples, general tactics, and strategies along with specific prevention, intervention, and postcrisis logistics and techniques that can be applied to almost any crisis likely to be confronted on a college campus. • a decision-tree model to guide the response and recovery to crisis. This book provides the necessary tools to address the emotional, cognitive, and behavioral responses of students and staff as they attempt to negotiate a crisis and its aftermath.